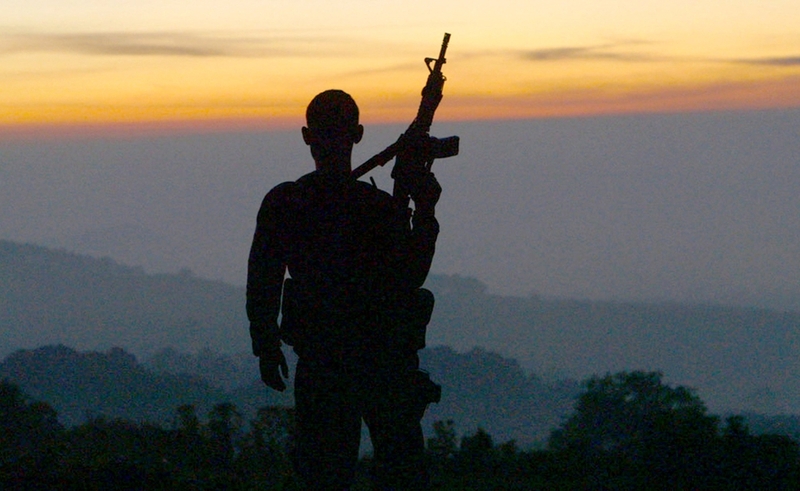 Any discussion of how the evolution of digital cameras has transformed documentary filmmaking would do well to start with Matthew Heineman’s Cartel Land, a work of both stunning beauty and stunning immediacy. There is footage in the film—of gunfights, of meth cooks, of night expeditions into the hills along the U.S.-Mexico border—that would not be possible with the cumbersome cameras and crews of the past, with Heineman essentially going on ride-alongs as heavily armed vigilantes go about their business. At the same time, shots are carefully composed and seductively filmic, like sweeping aerials of the Wild West landscape and self-styled rebels posing in silhouette against an orange-streaked sunset. Over the past few years, we’ve seen many strong non-fiction films that are either one or the other: The you-are-there doc Restrepo and its sequel, Korengal, are like visual journalism, embedded in a disputed valley in Afghanistan; and a number of other non-fiction films, from These Birds Walk to 12 O’ Clock Boys, have an ecstatic beauty that evoke the term “Malick-esque.” But Cartel Land, which tellingly won both the director and cinematography prizes at Sundance earlier this year, combines both qualities to devastating effect, like real life framed as a breathlessly paced thriller. It also makes Heineman seem like the filmmaking equivalent of an extreme-sports junkie, forever chasing that adrenaline high. The opening scene of Cartel Land follows a team of meth cooks into the woods under cover of darkness, their faces covered to remain anonymous and to filter the toxic fumes. Their leader, who learned to cook from an American chemist and his son (shades of Breaking Bad), admits that he knows his drugs do harm in the U.S., but that all of his men come from poverty and will keep on cooking for “as long as God allows.” The interview is just the first in a long series of rationalizations from the film’s subjects, who are trying to find their way through a moral quagmire, and it also sets up the supply-and-demand relationship between the cartels and their American customers. Everyone’s hands are dirty. From there, Heineman runs the film on parallel tracks, focusing on two vigilante leaders working on opposite sides of the border. In Mexico, Dr. José Manuel Mireles spearheads a citizens’ militia called “the Autodefensas” to drive the Knights Templar cartel out of the Michoacán region, where they’ve terrorized the locals and corrupted the government. (As a prelude, Heineman interviews a woman whose entire extended family was slaughtered by the cartel, despite having no involvement in the drug business. They were laborers killed because their boss at a lime farm failed to pay his protection money.) In the U.S., Tim “Nailer” Foley, a leather-skinned crusader with a checkered past, leads an organization called the Arizona Border Recon on missions to keep cartel scouts and mules from crossing over the porous border. Foley’s operation began as an anti-immigrant militia, but readjusted its mission after the drug wars raged to such a degree that he felt action was necessary. Heineman studiously avoids any editorializing, at least in the sense that it’s quite possible for two different people to witness what Mireles and Foley are doing and believe them to be heroes or hopelessly compromised or somewhere in between. But the compare-and-contrast is revealing in both directions: As a lesson in vigilantism, Cartel Land implies that once that Pandora’s box is opened up, it’s hard to close the lid. Mireles and the Autodefensas enjoy some remarkable victories against the Knights Templar, methodically driving their members out of their sanctuaries, but Mireles can’t control some personal score-settling and the pervasive influence of cartel money and connections within his group. Foley’s operation is smaller and easier to control, but his willingness to accept men whose politics veer awfully far to the fringe throws the righteousness of his crusade into question. (To Foley’s irritation, the Southern Poverty Law Center labeled the Arizona Border Recon a “nativist extremist group.”) More subtly damning is that all the combat in Cartel Land comes from Mireles’ side, as the Autodefensas lock horns with a cartel noted for its brutality; by contrast, Foley’s missions seem less tangible, driven as much by Hannity-fueled paranoia as a clear and present danger. Though Cartel Land isn’t interested in making fact-filled statements about the drug war, Heineman’s ingenious conceit gets at the difficulty ordinary people have in doing something about it. Mireles and Foley have reason to conclude that they live in lawless territories, where the police and the government are either ineffectual or hopelessly corrupt—and as men of action, they take it upon themselves to gather other intrepid citizens and dole out justice. But the flow of money and drugs back and forth across the border—and the violence and bribes that make it possible—make them seem like reeds in a mighty river. They can’t stop the river; the best they can do is not get caught in the undertow.